My argument thus far can be summarized as follows: the greenhouse gases emitted by individuals have a small but fully real effect in that they increase the exposure of vulnerable people to the risk of serious suffering from climate change harms, now and in the future. These individual emissions are sufficient to do so and also necessarily have this effect. From this follows that individuals have a unilateral duty to reduce the emission of greenhouse gases that they can reasonably avoid. Promotional duties are very much necessary as well, but cannot substitute this unilateral duty to reduce emissions. In the run-up to the international climate change conference in Paris in December 2015, there is much debate about what our governments and political institutions should do in order to tackle climate change. Important as this may be, I believe this focus should not obscure the role of individuals. Nonetheless, according to the general perception as well as some accounts in climate ethics, individuals do not appear to be responsible for climate change, or have any agency in tackling it. I believe this view is mistaken. In this series of posts, I will therefore try to address some pervasive, but (in my view) misleading assumptions regarding individual responsibility for climate change and offer some fresh arguments. (1) The first two posts deal with backward-looking concerns about the identification of individuals as being responsible for climate change, the latter two with forward-looking issues in actually combatting climate change. First, I will debunk the belief that the effects of individual greenhouse gas emissions are insignificant. On this basis, in the second post, I will address the assumption that individual emissions are neither sufficient nor necessary to cause climate change. In the third post, I will advocate direct, unilateral duties to reduce my emissions. Finally, I will give some suggestions regarding what each of us could or should do to tackle climate change. 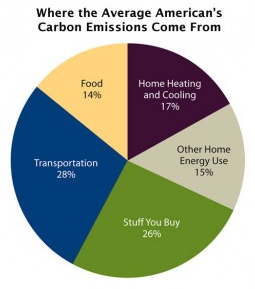 In this post: Are the effects of individual greenhouse gas emissions truly insignificant?